The show will offer storytelling workshops for Indigenous youth ahead of its three-day run at West Village Theatre. Yolanda Bonnell performs a mix of physical theatre and spoken word in bug. Photograph provided by High Performance Rodeo. Artist collective manidoons is presenting its show bug, created and performed by Yolanda Bonnell, from January 18 to 20 as part of the High Performance Rodeo. 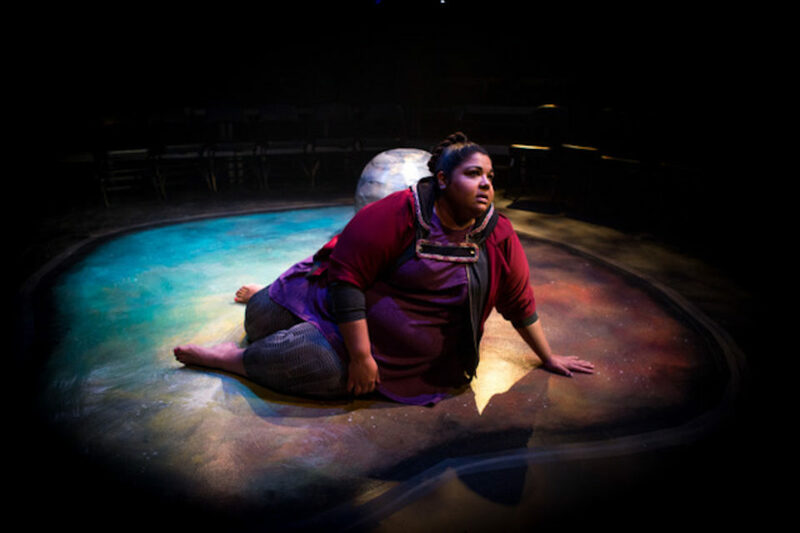 Partly influenced by Bonnell’s training at Humber College in Toronto, the show uses a blend of physical theatre and spoken word to tell the story of a family of Indigenous women as they grapple with intergenerational trauma and addiction. The one-woman show explores the deepest recesses of pain, in turn uncovering the awe-inspiring strength of its subjects. Though Bonnell certainly doesn’t lack in imagination, one of the reasons the emotion of the story is so extreme is because it comes from a very real place. She grew up on the Fort William First Nation reserve near Thunder Bay, a city where she says violence against Indigenous women is commonplace. Bonnell also experienced addiction firsthand, which informed the show’s metaphorical device of bugs (or manidoons) standing in for the infestation-like properties of addiction. If you think that’s difficult subject matter for an audience, consider what it must be like to live it and then relive it on stage. “I find that there’s a part of me that sort of gets torn open where I have to channel these women and tell their stories,” says Bonnell. “But I have a really fantastic team around me that shows nothing but love and support, and will be there for me when those moments happen.” Furthermore, her training as an actor provides the tools to keep the characters from overtaking her psyche, and precautions are taken not to over-exert her voice or body during performance. That team includes (but is not limited to) director Cole Alvis — who is the director of the show and co-artistic leader of manidoons — and Ashley Bomberry, who is the associate director and cultural keeper for the show. Bomberry’s role as cultural keeper includes making community connections for the show’s performances, decolonizing the environment surrounding the performance and helping to facilitate a vital bug tradition: youth storytelling workshops entitled oshki misko minowe. Whenever bug is staged, Bonnell and members of manidoons make sure to set aside time to mentor Indigenous youth on elements of storytelling such as spoken word and poetry. “I think one of the things that we often forget is how incredibly intelligent and perceptive young people are, and how talented they are,” she says. Held in the days immediately leading up to performance, these workshops offer a haven for exploration and the option for participants to share bug‘s stage. “We were gifted with a creation story by an elder named Pauline Shirt and we thought it would be a really great pre-show for our show,” she says. “At the end of the workshop we would tell [youth participants] the story and then they would take that story and turn it into a whatever version of it that they want to tell.” Upon the workshop’s conclusion, participants are offered the chance to perform their interpretation of the creation story during bug‘s run. As a mirror to a difficult reality, bug may prove to be an uncomfortable show to witness. But the story’s arc mirrors Bonnell’s words at the conclusion of our interview.